Do you have an upcoming trip planned to Dubai? A long layover in Dubai? Where is Dubai? Relax, we've got you covered. First of all, no, Dubai isn't a country. 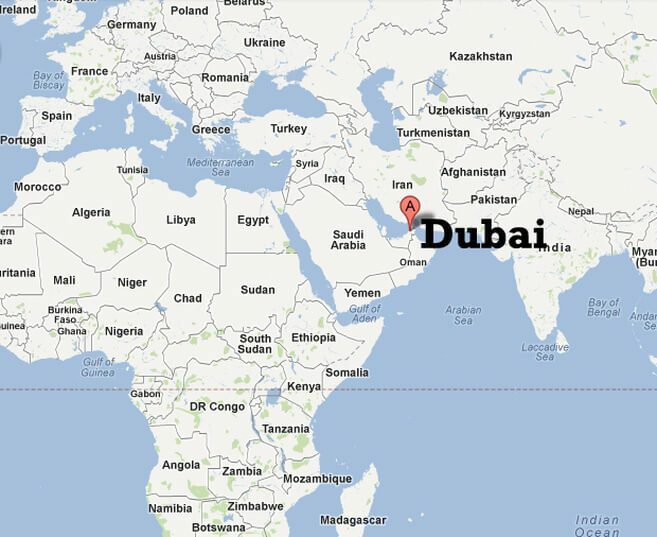 We've all made the mistake, but this is the where thing to know when you wonder where is Dubai. Dubai is one of the seven emirates which comprise the United Arab Emirates, commonly known as the UAE. In 1973 the rulers of the different emirates came together to form a union, naming Abu Dhabi, the second most popular emirate, as the capital of the young country. While everyone tends to only think of Dubai, there are six other emirates which make up the country, while the majority are unknown and relatively undeveloped. The seven emirates are Dubai, Abu Dhabi, Sharjah, Fujairah, Ajman and Umm Al Quwain, with Abu Dhabi being the only other emirate developed nearly to the level of Dubai and making up the vast majority of the landmass. The United Arab Emirates is a peninsula which borders Oman to the East, Saudi Arabia to the South and shares a maritime border with Iran across the Gulf of Oman, via the Strait of Hormuz. Many think that Dubai is the capital of the country, with its ruler, Sheikh Mohammed, as the president of the UAE. Sheikh Mohammed is actually the Vice President of the UAE and ruler of Dubai and has taken great measures to ensure that Dubai remains on the absolute forefront of economic development making tourism a top priority and building some of the most impressive and well-known buildings anywhere on Earth. Our single favorite thing about Dubai might actually be its location, which is shockinly within an 8 hour flight of 60% of the world's population. How crazy is that? Where is Dubai? In the middle of the world, literally. One of the reasons we travel so much and can afford to spend 48 Hours in Beirut, is because Dubai is so centrally located. Dubai residents can be to India, Sri Lanka, Africa, Eaurope and Asia within just a three to four hour flight, which few people realize. Dubai is known as a glistening gem in the middle of the desert and it should be viewed as one. The vast amount of development that has occured in this country in the last twenty years is absolutely astounding. It is a shame that so many people automatically have worried thoughts when thinking about visiting because of recent events in the Middle East. The UAE is hands down one of the safest countries on Earth with nearly zero crime. We regularly leave our door unlocked, don't stress about leacing our belongings around and if you forget your cell phone in a taxi, they'll bring it back to you.